It’s very rare to cover a mystery that could actually be real paranormal, just unknown by science, hidden knowledge. And coral castle is one of these mysteries as still to this very day it still remains unexplainable. Coral castle was built in the early 20th century by a very unusual man named Edward. Edward was from Latvia and he decided to leave his homeland and come to America after he was rejected by the girl he loved. Now this girl was only 16 years old and I am not sure how old Edward was at this time but I do believe that he too was also fairly young. And he would always call her his sweet 16. And after he was rejected by this young women he moved to Florida. Then eventually got himself a 10 acre piece of land in homestead just south of Miami. Then he started to build coral castle for this young girl that he loved so much. Now Edward was only 5 feet tall and only weighed about 100 pounds but yet he was somehow able to move these huge coral slabs all by himself. Which in are known reality should be impossible. I mean some of these slabs are just enormous they weigh up to 30 tons. And when this site was all finished about 30 years later these coral stones were just so perfectly aligned that they needed no cement. It is just unbelievable how this lone man was able to achieve something like this. One of his creations was a rocking chair that weighed thousands of pounds. And you can just use your finger to rock it back and forth. The entrance slab weighs about 9 tons it is 80 inches wide, 92 inches tall, and 21 inches thick. It fits within a quarter of an inch from the outer walls and it is balanced so perfectly that anyone can open it with just the slightest touch. 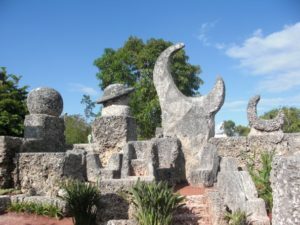 People who are sensitive to electromagnetic fields say that they will experience a very bad headache when entering into coral castle. Making many people believe that Edward knew something about these magnetic fields. Something we still don’t understand to this very day. Yet Edward and it is also believed that some of our ancestors did know how to harness this power in order to lift extremely heavy objects. Such as Puma Punku, the Pyramids and many other ancient sites. Edward himself even said that he had discovered how the ancient Egyptians had built the pyramids. 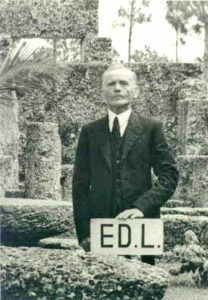 And who are we to argue with him as he did create coral castle all by himself. Another interesting thing about this man is not to long after he moved to the United States he came down with terminal tuberculosis and he was somehow able to cure himself. And when he was asked how he did it he replied magnetics. Now in the 1930’s Edward moved his entire castle all by himself to homestead Florida. And no one saw him load, unload or put back up all these enormous coral slabs which in itself is a mystery on its own. And many do believe that he had help but no one has ever come forward claiming to help him. And even if he did have helpers it still doesn’t take anything away from this amazing achievement as some of these stones can’t even be moved with a 100 men. And there is just no way that Edward would have had that many helpers as someone would have come forward. And also Edward was a very secretive man he didn’t want anyone to know how he was doing this. Making it highly unlikely that anyone was helping him. And also he only worked at night, this man went to great lengths to hide his secrets. And sometimes people would try to spy on him and they would see him touch the coral with his hands then he would just stop. It’s as if he knew that people were watching him. So in the end not one person ever saw him work. And he worked for more than 30 years. Now coral castle also has a lot of celestial alignments. He was obsessed with the energy of the earth and the stars. Some even called him a student of the universe. And many believed that his secret lie within a coral structure known as the tower. This is the place where he worked and lived, he would never let anyone inside the tower. So many believed that he kept something of great importance within this coral structure. A device that he created that enabled him to lift these massive coral slabs. Such as an anti gravity device that could harness the power of harmonic sound waves or magnetism. He even showed people a generator which he created and designed so he could listen to the radio while he worked. He also built his own air conditioners, clocks and many other unusual devices. This was a very unusual and very intelligent man, he knew something that not even our greatest minds can figure out. And for whatever reason he didn’t want us to know this knowledge. Maybe for our own safety. And Edward believed that all matter consist of magnets and he would tell people that he had re discovered the laws of weight, measurement and leverage as he could manipulate these laws, these forces by using celestial alignments. He also claimed to see beads of light which he believed to be the physical presence of natures life force. And all though no one had ever actually seen him working they did witness him doing some very strange things. Such as one time one of his neighbors said that he saw Ed singing to the rocks. And while he was singing to these rocks his hands were touching them. It was as if he was trying to make them lighter or levitate. And the neighbor stated that it was just a very, very strange thing to see. One time a group of kids claimed to have actually seen him working. They said that he was somehow able to make these coral rocks float, like he was able to turn them into hydrogen balloons. But since these kids were young many believed that they were just making up stories. Now over the years there have been many theories as to how Edward was able to do this. Many believe that he did know how to make these huge coral slabs float or levitate by using sounds waves or magnetics and celestial alignments. But in order for him to achieve this he had to be in a certain location, a location that made it possible for him to break the laws of physics. And homestead Florida is believed to be one of these locations as well as pretty much all ancient sites on our earth were huge stones have been lifted in the past. Such as the Pyramids, Stone Hedge, Puma Punku , etc.. As it is believed that these ancient sites or locations possess a certain type of energy field that makes it possible for one to lift enormous stones. But of course you have to know this secret knowledge first. And many believe that Edward and many of our ancestors did. And still to this very day scientist, scholars and just your average person ventures to coral castle in hopes of finally being the one to crack this mystery. And in the end all they can do is just stare in total amazement and wonder how such as small a man with only a 4th grade education was able to achieve this amazing castle of coral all by himself.